24-Port Web Smart Gigabit Ethernet Switch. This is high-performance yet cost-effective Gigabit solution for enterprise backbone and data centre networking. The PLANET GSW-2404SF is the Layer 2 Web Smart Gigabit Switch which can handle extremely large amounts of data in a secure topology. 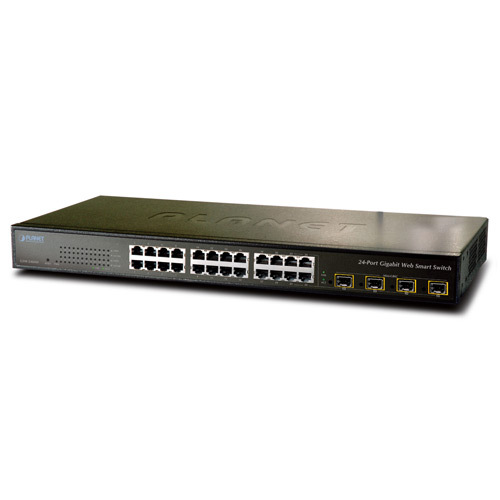 The GSW-2404SF provides 24 10/100/1000Mbps Gigabit Ethernet ports with 4 shared Gigabit SFP slots. It is capable to provide the non-blocking switch fabric and wire-speed throughput as high as 48Gbps.